The episode starts out with our four hero’s having Thai for dinner…Howard ask if there is peanut oil in his because he is allergic…Leonard doesn’t think so but says they should all watch him, Sheldon offers to share his epinephrine pen if Howard does have an allergic reaction. Knocking at the door and who is it but Penny. Leonard steps out to talk to Penny in the hall. Penny has just come from her job at the Cheesecake Factory (Again these guys must be catering on set or something) where she apparently makes minimum wage. So apparently she makes minimum wage and can afford an apartment across from two scientists who probably do not make minimum wage. Penny is having furniture delivered tomorrow and having known the guys for all of a few days ask gives them a key to her apartment so they can receive it for her…Leonard agrees to do her a favor before she can even ask what the favor is. All the guys come out to the hall to see what is going on. Howard immediately speaks in Russian –telling Penny she is beautiful and in general freaking her out. Penny says hello to Sheldon and Raj and Raj still can’t talk to women. Sheldon explains it is a real problem for him to speak to women (Making him the perfect man in my opinion). 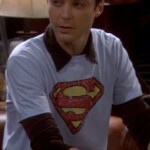 Leonard invites Penny in for dinner and a Superman movie marathon (Sheldon is wearing a classic Superman tee so he is dressed for the occasion) Penny is surprised there is more then one Superman and Sheldon is HORRIFIED that Penny doesn’t know there is more then one Superman movie. While the guys argue over the science of Superman, Penny goes into her apartment and the guys realize they are locked out. Cut to the morning where Sheldon is up and happy and Leonard is tired and worried. Sheldon apparently has a hard time understanding sarcasm. You hear a very loud Son of a _itch…. and Penny comes over. She is TICKED. Penny tells the guys to stay away from her. 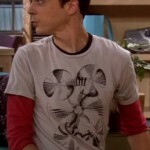 Sheldon ask Penny if she is upset that they were in an apartment or that he cleaned. Leonard tells Sheldon he has to apologize. Sheldon goes to apologize, kind of. Leonard is at Penny’s door…sliding a note under it when she opens the door. He goes to apologize and ends up reading the letter. Penny smiles and stops him and hugs him, kisses his cheek and tells him they are ok. Leonard walks into his door. All four boys are in Penny’s apartment volunteering to put her new furniture together while they “fix” the directions Penny starts putting it together. When she tells them she has it, they ignore her, to the point that when she says she is going to take off all her clothes they ignore her. She keeps working on her furniture. The guys Leave to go get what they need to improve her furniture and she is putting together the original package and does decide her place looks pretty good.